Farm to Vape is please announce two new flavors, Menthol and Tangerine. Menthol adds an icy spin to the mix while Tangerine adds a sweet citrus flavor. 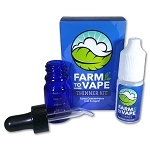 Farm to Vape Thinner is now available in a quart size as well. Farm to Vape is an easy way to convert your legal concentrates into eliquid in only three minutes. The convenient dropper top fits many popular cartridges and vaporizer tanks filling holes alike. Depending on the type of concentrate you are using depends on how much FTV to add. Live resins, isolates & distillates can go much stronger ratios like 1:1 or 1:2. Shatters and waxes are best suited for a 1:2 or 1:3 ratio since they contain more cellulose waxes.